The Throwback: Jem is back! Perhaps we should be saying, "Showtime, Hub!" instead. This week, the Hub network began airing reruns of '80s cartoon "Jem" in all its "truly outrageous" glory. While it may be grammatically incorrect to use a noun to describe a noun (unless you're talking about CatDog), the theme song does just that (adjectives be damned!). Also, "the music's contagious" and our heroine is not just "truly outrageous," she is "truly, truly, truly outrageous." A triple threat if there ever was one. "Jem" originally aired between 1985 and 1988 and maintains a devoted fan base to this day. The series centered around Jerrica Benton (Jem's top-secret alter-ego) who, upon the death of her father, inherited a record company and a foster home. He posthumously left Jerrica a final gift - Synergy, a holographic computer that helped Jerrica and her friends turn into the girl band Jem and the Holograms. As Jem, Jerrica fought to keep the Starlight Foundation open despite efforts of rival bad girl band "The Misfits." Also of note: Jerrica's long term boyfriend, Rio, simultaneously dated Jem, blissfully unaware of her identity. Basically, Rio was the Lois Lane to Jem's Superman and Jerrica's Clark Kent. Jerrica apparently didn't mind. CNN spoke to Britta Phillips, the singing voice of Jem. CNN: The show ran for three seasons... Did you record the music all at once or was it spread out over three years? Britta Phillips: It was spread out. When the episodes were written, we'd do the music first and then they would animate to that. I think it was the same as the speaking voice. I did the singing voice and the music in New York and they did the speaking voice in L.A. and then they would send it to be animated. CNN: Did you coordinate with the actress who did Jem's dialogue? BP: No. We never spoke to them and I just met Samantha Newark (the actress who voiced Jem's dialogue) for the first time a couple of months ago. There was no communication. Of course we knew about the stories and the characters from seeing the show after it aired but that was it. CNN: You're a professional musician. How realistic a portrayal of the music industry was "Jem," and would the Holograms have made it today? BP: Well, the industry as it was then hardly exists now. Then it was about huge CD sales - well, actually huge CD sales didn't start until about six years after that, but that was the beginning of it - and now it's all about downloading. [Celebrities] just aren't as huge as they used to be. Now, obviously, there are some exceptions, we still have a few stars, but it's different. As for whether they would've made it, well...I would say, I guess so. It would depend on their representation (laughs). CNN: From a musician's standpoint, which of the three groups do you think was the best - The Holograms, The Misfits or The Stingers? BP: I really liked The Misfits (laughs). It's really song-by-song. I'm not as familiar with The Stingers' stuff but I really loved a lot of the Jem stuff too, though. Some of it was pretty sophisticated. But I loved the "bad girl" attitude of The Misfits. CNN: How many times during your career have you touched your ear and said, "Synergy"? BP: The first time was at the JemCon I went to and maybe once at a gay bar (laughs). CNN: Wait! There's a JemCon? BP: I think there are a few. I've been hearing about them for a couple of years and then they had one that was sort of near me. I live in New York and it was in New Hampshire and I was able to go to that one. There were people from all over the world. There were people from Holland and England and Italy and Mexico. It was pretty wild. CNN: What was the deal with Rio's hair? Don't you find it strange that he was dating both Jerrica and Jem, even though he didn’t know they were the same person? BP: As for the hair, it was the '80s. And in the '80s I had green and pink and different colors in my hair, so... You know sometimes TV and movies ask you to swallow something that's a little hard to believe, but it was a cartoon. He probably should have known that they were the same person but one of them was very glamorous and... I don't know, it was weird (laughs). CNN: Have you ever run into fans of the show that recognized your voice? BP: No, but usually people find out it's me and come to a show. I play with my husband - we call ourselves Dean & Britta - and they've found out about us online and will tell me at the show. 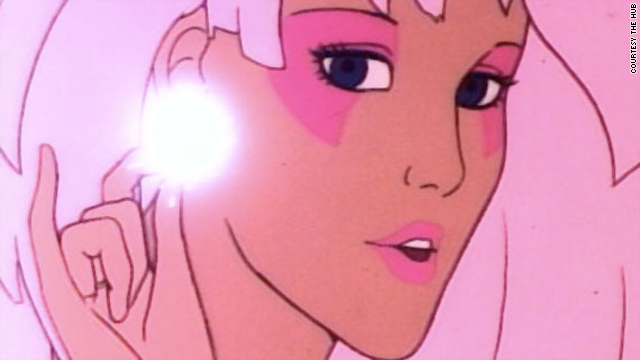 CNN: What questions do "Jem" fans always ask you? BP: They always ask me what my favorite song was. It's always a different answer. And they ask me to sing the theme song. CNN: Do you have a Jem doll? BP: I have one from way back then and someone gave me a custom one at the JemCon. CNN: The series actually had a finale where the three bands declared a truce. Were you sad when it ended and what do you think the show's legacy is? BP: I was sad when it ended but I was busy doing some acting at the time so I think I would've been sadder if I hadn’t been busy doing something else. I was kind of surprised it ended because I had heard the show was quite successful, but then I was informed that it was really canceled because the dolls weren't selling well. And, I guess, the show was created to sell the dolls. Of course, they were too big to fit into Barbie clothes, so that might've been part of the problem (laughs). As for the legacy, it's a great time capsule of the '80s. It's the only animated show with MTV band videos in it. And it was kind of an adult show for kids that had some unusual things in it. What about you? What are your favorite "Jem"-ories? Next entry »'Showbiz Tonight' Flashpoint: Is Rihanna playing us to sell albums? I went nuts when I stumbled across Jem on Hub the other day. LOOOOOVED this show growing up and already programmed every upcoming episode into my tv. It's still hot after all these years! Jem is truly outrageous. Jem lovers should look up the first JEM / Misfits / Stingers cover band, SPLEEN. From 1989 to 1995 they performed the music without explicitly naming the source of the songs. They were very popular in San Antonio and without knowing where the songs came from many listeners became hooked. All their songs are available free on the web. My favorite song was the one that one of the Holograms sang a duet with a Misfit. I think it was called "I'm OK". That sounded like a song that should have been on the radio. Jem does bring back memories. The eighties weren't that bad when you think about it. JEM is JIM in drag. I want to change my name to jem. I will ask my mommy if I can. OMG, I'm so excited! I've told my 10 yr. old niece about this show & now she can see it for herself! If they ever do a live version of the series or a movie, my niece would be perfect in the role!! A few yrs. down the line, that is. Hey Monica, you are probably sitting on a gold mine, if you can find that original doll! Synergy! Dont even have a comment for this. I graduted in 1983 but dont remember this cartoon at all. Movie!!! Movie!!!!! I say they do a movie!!! Live action!!!! Transformers, Smurfs, Scooby Doo, Why not Jem? My favorite memory of Jem is that I have absolutely no memory of Jem. My kids looked at me as if I had lot mind when I was singing along with their self proclaimed new cartoon. I explained to them that this is Mom's all time favorite cartoon. I LOVE JEM!....i have the 1st season on DVD!! !...they were fashionistas...the fashion is still fly til' this day!...the 80s baby!!!! I loved Jem as a kid. I had the Jem doll and her and my micheal jackson doll got hours of play. I think it might be time to break her out again. Long overdue!! I secretly rooted for the misfits. lol the best thing is my work's holiday party last year was an 80s theme. I went as Jem. Perfect! Jem is for "say no to drugs" losers. Its all about Jiz now! You better watch or she'll killllllllll youuuuu. I'll be damned if I have to F&@k Rio sober! The show really isn't that good...not at all what I remembered!! We named our daughter, Jerica, in July 1988 aftter watching Jem for years!! We have a living, breathing reminder everyday!! I remember Jem from my days as a Girl Scout Brownie in Louisiana. My fellow Brownies and I would run out to the playground where there was this old tree after our meetings. As soon as we hit the tree, we would start climbing and singing the theme song. I have fond memories of us yelling, "truly, truly, truly outrageous...OOooo, Jem!" The funny thing is we all thought we sang just like Jem. Oh, and Belinda Carlisle!!! What's up with all The Hub stuff popping up on here? First My Little Pony and now this. "Centered around." This article would have been hilarious, if not for that grammatical gaffe. How can you "center around" anything? My favorite episode was the father's day one. And Synergy was the bomb. Hey Kara, Don't forget Gilligan's Island, Bewitched, & I Dream of Jennie ! yes!... I loved those ones too! I loved Jem as a kid. In high school we had to write and give a persuasive speech. Mine was about Jem versus Barbie as a role model for girls. I got an A+. To this day it is still my favorite thing I ever wrote! too funny that this is in the news... At the age of 30, I was crazy excited when I saw that the Hub had the Jem series on and Saturday mornings non the less!! I think Saturday morning cartoons are the best and too many kids miss out on them today since there really are not many. I even recorded the shows and watched them with my friends daughter who couldnt stop talking about them. I think that a station should be dedicated to the best of past hit shows. I love that the Hub also has Lavern and Shirley too. But why not have the Flinstones, Jetsons, Disneys Mickey Mouse club, Kids Incorporated, Wuzzles, Hopples, Gummi Bears, Carol Burnett Show, My little Pony, Rainbow Brite, strawberry shortcake, care bears, Alf, Dinosours, the list could go on and on! They could have a whole weeks worth of shows and for those of us who remember and loved them will love watching them again, and would love watching them with those whom it would be completely new to. I couldn't agree with you more! Hopefully it's only a matter of time before other shows reappear. I had to work so I recorded the Jem episodes myself this past Saurday. I stumbled across the Hub a few months ago when I saw Fraggle Rock in the listings. So glad this channel is out there! Several of the shows you mentioned were staples of my childhood and it's been great to relive those memories. I think cartoons help to keep us adults youthful. I'm just a bit older, but my teen daughter and I are hoping that "The Beatles" cartoons will be officially released someday. Only time I've seen those on TV was years ago for a short time on MTV (I taped some of them, that's how my daughter got to see them). Someone has been sitting on the rights to those cartoons for years, don't know what the hold up is. The sad thing is the jem cartoon band is better than 95% of what is out there in the real world. Jem is dead. Long live Jiz. Is this show "right up there" w/ My Little Pony ? I was her this year for halloween! I LOVE THIS SHOW! OOOHHH... and the Hub has the original Transformers on too!!! I was also very excited to see this. I liked Jem too. My sister had to watch Centurions, Thundercats, He-Man, SuperFriends, etc. ; and my brother and I had to watch Jem, She-Ra, Rainbow Brite, etc. That is exactly the order of shows that I recall my son watching, he was five when Jem debuted. He had the biggest crush on Jem, he also had crushes on She-Ra and Man O' War's daughter, not sure of her name. I remember they had a phone-in "sing the theme song" contest. My friend and I practiced for days so we could call in and record ourselves singing the theme song. I still remember a lot of it! had a Jem doll that was the first purchase I made with my "own money." $11 was a lot to me then. I'm 33 now; I wonder if that doll is still in my parents' garage somewhere. That's so funny you all remember that singing contest- I won third place! They sent me a letter of congradulations in the mail, saying a concert jacket and poster were to arrive soon. I never received the prize though :(. I still love to sing, I'm a karaoke queen. Jem would be proud, lol! OMG I used to LOVE this show!!! It was my favourite, I used to rush home for lunch to watch it!! I loved Jem, but boy did I like the Misfits!! I excited to watch the reruns! JEM has a nice JimDawg. I always hated Jem's music. But her rivals the Misfits had awesome music. When I was a kid I used to think, Why can't Jem be the one making the good music instead of the villains. That was when I started rooting for The Misfits. I rooted for the villain on Lady Lovely Locks. Duchess I think? Man, that was a long time ago!! I can tell this guy was excited!